LOS ANGELES, November 28, 2018 – Hyundai today introduced its new flagship high-end Palisade SUV three-row vehicle to global media at the Los Angeles Auto Show. The Palisade 2020 is based on an all-new SUV chassis offering exceptional second- and third-row livability, generous cargo space and flexible reconfiguration. The palisade will be produced in Ulsan, Korea, and will be available at dealerships in the United States in the summer of 2019. 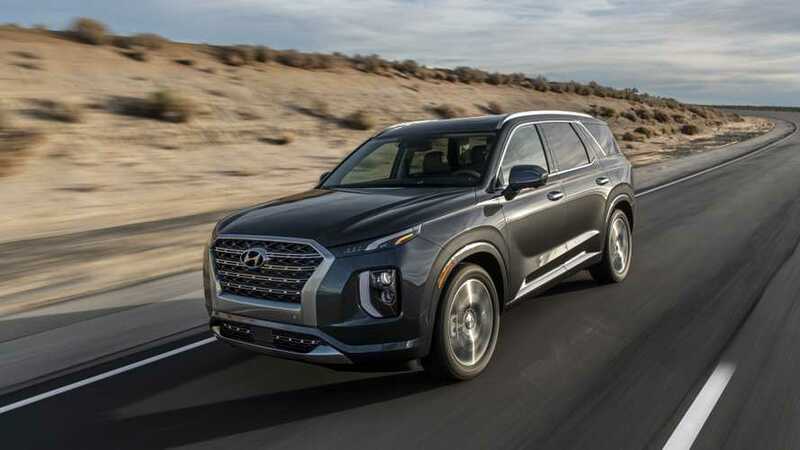 "The new Hyundai Palisade 2020 clearly evokes design images worthy of Hyundai's flagship SUV, with new levels of off-road capabilities, all technologies, technology, safety, space and efficiency, all in a cutting-edge design, "said Mike O & # 39; Brien, vice president of products, business planning and digital, Hyundai Motor America. "This new Hyundai SUV is the ultimate family vehicle for comfortable and convenient everyday use as well as for memorable journeys on the road whenever the lure of the unobstructed road should catch the eye." "The exterior and interior design of Hyundai Palisade clearly reflects its unique flagship identity with a premium, distinctive and bold road presence," said SangYup Lee, head of Hyundai's design center. "As a Palisade Design Manager, it has been a pleasure working with our international design teams throughout its development and presenting this phenomenal product to you today." Palisade's style reflects dignity with style in a sober theme that demonstrates a clear differentiation worthy of a flagship SUV. From the front, a dominant, bold and wide cascade grille is clearly an upscale SUV. Separate composite headlights and a vertically connected front lighting signature create a strong and distinctive front-end behavior, with LED headlights, LED daytime running lights and LED mirrors available. The extended and powerful hood profile creates an impressive presence on the road, while the bold C pillars and the panoramic glass side graphic lend great generosity to the third row. The reinforcements and the flanks of the whole volume offer muscular details. The rear view emphasizes a wide and stable position thanks to sinuous details and a vertical LED taillight design. The panoramic rear window coupled with a sectional roof gives passengers a sense of spaciousness. The available 20-inch alloy wheels add to Palisade's flagship presence. This design also has aerodynamic advantages, with a drag coefficient (Cd) of 0.33. Palisade achieves this low drag coefficient with specific design benchmarks that include a quick A-pillar angle, a rear spoiler side trim, an optimized front cooling zone with extended internal air guidance, bottom panels. aerodynamic and aerodynamic rear wheel baffles. The interior design combines a feeling of relaxation and comfort creating a serene environment with standard eight-passenger seating for family adventures. The leather-trimmed models feature premium quilted Nappa leather, while on the dashboard, a smooth woodgrain trim in an enveloping interior design creates a spacious and comfortable ambience. The One-Touch second-row seat allows the seat to be used one-touch forward and outward for easy access to the third-row seat. For convenience, the third row features power tilt and recline seats. The second-row captain's seats are also available with ventilated seats. Each Palisade seating row provides convenient USB connections for all passengers, for a total of seven USB ports available. Even more, a conversation mirror allows the driver to clearly see the passengers at the back. Palisade also offers a class-exclusive invisible vision monitor, which complements the standard blind spot collision avoidance wizard, which offers easy-to-see body-side views when the turn signal is on. The audio and navigation display is a large 10.25-inch widescreen touch screen, combined with a 12.3-inch full-digital TFT central dashboard offering a variety of viewing modes and differentiated driving mode lighting . Two Bluetooth® devices can be connected simultaneously, one for connecting a mobile phone and the other for streaming audio. The unique IP instrument cluster built into the navigation provides exceptional readability and ease of use, coupled with a head-up display feature available. Central console innovations, such as motion controls, provide valuable control space for the features most used by drivers. The Shift-by-Wire system also includes an automatic parking logic that allows the vehicle to enter parking mode when the engine is stopped and the driver opens the door. The Palisade Center Console Bridge also frees up convenient storage space under the control area of ​​the center console with convenient access for the driver and passenger. The interior features seven USB outlets available, including USB outlets for second-row occupants and mini-pockets for digital devices of all kinds. A generous 16 cupholders mean that there is always a place to put a drink in any place. The seat belt connection notification to the driver is active in all seating positions. Palisade also offers a new, innovative rooftop ventilation concept, capable of providing concentrated, partially or totally diffused airflow to the rear passengers. This new diffuser vent design offers a quieter rear air conditioning airflow, a no – air operation, a more even air distribution and the ability to concentrate the airflow. flow of air at all times. Palisade offers abundant technology, including Hyundai's latest navigation system with Android Auto ™ and Apple CarPlay ™. To eliminate the need for a charging cord, there is a wireless Qi charger available for compatible Android devices as well as recent Apple iPhones. As far as audio technology is concerned, the premium audio system available is well suited to the high-end interior of the Palisade. The audio system incorporates Clari-Fi and QuantumLogic ™ Surround Sound technologies. Clari-Fi works in real time to reconstruct lost audio details in digitally compressed music, while QuantumLogic ™ extracts signals from the original recording and redistributes them in an authentic multidimensional sound environment for clear, refined and detailed playback . The result is a more robust and enjoyable on-road listening experience. Inspired by aeronautical technology, the Heads Up Display (HUD) system available in Palisade projects a virtual image on the windshield, helping the driver to better keep their eyes on the road. The function uses a mirror system associated with a color TFT LCD display and adjustable brightness to ensure excellent visibility day and night. Driving information such as speed, status of intelligent cruise control, navigation, assistance to avoid blind spot collisions, assistance to avoid forward collisions, speed limits, Tracking assistance and audio system data are projected at an ideal virtual distance for optimal readability. Palisade also offers a built – in "Driver Talk" on – board intercom system with conversation at the back and stand – by modes. This system allows the driver to communicate separately with the second and / or third rows of the vehicle via the Palisade audio system in conversation mode. The system also includes a rear standby mode that allows the driver to listen to the selected sound without the same sound being transmitted to the second and third row audio speakers, so as not to disturb potentially sleepy passengers. Palisade's design is looking for great openness and exceptional visibility with a large fixed glass rear sunroof opening, wide rows of rear seats and generous, reconfigurable rear cargo space. All rear access areas have been ergonomically designed to facilitate family access, with a third-row reclining seat backrest, flip-flop and reclining at the back. rear electric control. The palisade is larger in all exterior dimensions than Santa Fe XL and Toyota Highlander. Inside, Palisade offers more legroom inside the first and second rows than Pilot, Pathfinder and Explorer. It also has more cargo volume behind the third row than Highlander, Pilot and Pathfinder. The power of Palisade comes from a 3.8-liter Atkinson-V6 CVVT twin-engined, direct injection engine for optimum power and efficiency. This 3.8-liter engine produces an estimated 291 horsepower at 6,000 rpm and approximately 262 lb-ft. torque at 5,000 rpm. Palisade offers more standard horsepower than any other SUV as a whole competitive and an unparalleled level of torque. Palisade provides this power to the wheels via an eight-speed automatic transmission with multiple-disc torque converter. It features HTRAC® two-wheel and four-wheel drive configurations, with a final gear ratio of 3.648 for assured acceleration. Special efforts have been made to reduce Palisade NVH, with generous insulation under the hood, special sound-absorbing mats and a powertrain adjuster offering a linear and smooth response. In addition, Palisade offers drivers the ability to start the vehicle via the remote keychain or via the Blue Link app. The width of the front and rear suspension has been maximized on Palisade, for increased rigidity and stability of the bearing. The tires are a generous standard 245 / 60R18 or optional size 245 / 50R20 for stability, style and ride comfort. The Palisade front steering knuckles and rear brackets are aluminum, while the lower front arms have been optimized and lightened thanks to a new technical design, which has reduced unsprung weight and improved responsiveness. .
Palisade also achieves the best torsional rigidity of its body thanks to a variety of methods, including a multi-ring structure and hot-stamped door ring parts that offer increased strength and rigidity. In addition, its torsional rigidity, when it is equipped with a sunroof, is almost identical to that of the versions without sunroof. The Palisade is equipped with Hyundai's HTRAC® AWD system. The HTRAC AWD system was developed as a multi-mode system, providing a variable torque split electronic clutch with active torque control between the front and rear axles. Driver-selectable Normal, Sport and Smart HTRAC modes provide safe control in any weather. The Sport setting gives a more agile feel by sending more torque to the rear wheels for a sporty, dynamic feel when you want it. This system has a wider variability range of torque distribution than many competing systems and has been adapted to conditions such as straight-line acceleration, medium and high speed turns, and hill starts. Palisade also offers a new snow mode developed on its advanced HTRAC® AWD system, with special traction control for snow, optimizing available traction and driver control under adverse conditions. The snow mode of the driving mode system adjusts the forward and reverse torque distribution, left and right wheel slip control, engine torque, and shift speeds based on available traction levels. In addition, the Palisade AWR HTRAC system includes an AWD lock differential function for difficult traction situations. Palisade offers a number of advanced security technologies including forward collision avoidance assistance with pedestrian detection, blind spot collision avoidance assistance, lane assist assistance, collision avoidance assistance by backward traffic, safe exit assistance, high beam system, driver warning and Smart Cruise Control with Stop and Go. Standard assistance for Hyundai Rear Traffic Collision Avoidance (RCCA) improves driver visibility at the rear of the palisade. By using the Blind Spot Detection System's radar sensors in reverse, the system can not only warn the driver if the vehicles are approaching from behind, but also apply the brakes automatically. Available security features include Rear Occupant Alert (ROA). The system monitors the rear seats with the help of an ultrasonic sensor that can detect the movements of children and pets. The system first reminds drivers to check the rear seats when exiting the vehicle with a message on the center dashboard display. If the system detects movement in the rear seats after the driver has left the vehicle and locks the doors, he will sound a horn and send a Blue Link alert to the driver's smartphone via the connected Hyundai Blue Link car system. The system is designed to prevent children and pets from being forgotten in the car, but it is also useful in case of accidental confinement of children. Palisade also has a standard secure exit assistance system. To enhance the safety of Hyundai passengers, Safe Exit Assist uses a radar to detect cars coming from behind and warns passengers trying to get out of the vehicle. If a passenger tries to open the door when a car is approaching from the rear, a visual and acoustic warning on the central group will warn the driver. In addition, if the driver attempts to disable the electronic child safety lock function, the safe exit wizard takes precedence and ensures that the rear doors remain locked until the approaching vehicle have passed. Once clear of the road, the driver can deactivate the electronic child safety lock and successfully unlock the rear passenger doors. In addition, Palisade has seven standard airbags: front, side, frontal, driver knee and rollover detection curtain airbags. Palisade uses a large full-length side curtain airbag, which includes a cover for third-row seats, which improves rear occupant protection in the event of a collision. Tire pressure monitoring with individual position display, anti-theft security, three second-row LATCH anchors, two third-row LATCH anchors and a reversing camera are also standard on Palisade. Palisade has a very rigid structure, with the strategic use of advanced high strength steel (AHSS) in key suspension and accident zones to provide increased tensile strength. The use of advanced high-strength steel has several advantages: a lighter overall vehicle weight, increased strength and rigidity of the vehicle without the excessive costs of more exotic lightweight materials. Palisade is expected to get the IHS TSP + and get the NHTSA's 5 star rating. The underbody and sturdy side structures are designed to increase the energy absorption and intrusion into the cabin during a serious collision, especially during the low overlap test. In addition, its base uses several charge paths to better disperse the potential energy during a crash collision. More details on vehicles equipped with Blue Link are available at www.hyundaibluelink.com. The palisade will be available in a number of exterior colors, including: Black Beckets, White Cream, Silver Lagoon, Steel Graphite, Argentine Burgundy, Moonlight Cloud and Rain Forest. Inner combinations include unique accent colors for the outer suit.